Like so many of the outtakes on the “sessions” discs unearthed and unleashed on the most deluxe version of the Beatles eponymous double-album, this newest version of “Let It Be” — the oldest recording of the song — is acutely alive and profoundly captivating. Fifty years in the books, and Beatles history still has room for an edit. In some ways, this one-minute, 18-second cosmic jam capturing the band in medias res — between takes of “While My Guitar Gently Weeps” — is just what should be expected, even if its very existence is still something of a minor surprise. A White Album-era version of “Let It Be” felt apocryphal, despite established knowledge rooting it in fact. And so it is that the disjointed, driving performance sounds like it’s out of time — it was. Notably, the lyrics of the song hardly advanced in the three months between September 5, 1968 and January 3, 1969, the first recorded performance of “Let It Be” at the sessions that would ultimately bear its name. It wasn’t until a few days into the sessions at Savile Row, on January 25, 1969, that most of the verses had been added. But Paul started teaching “Let It Be” to others in the band on January 8, when we hear Paul naming chords to the others to learn. That’s also when Paul disclosed that, even at this early stage, he planned to have Aretha Franklin cover the song. Students of the Beatles’ January 1969 sessions have heard this sort of thing several times before, someone in the group veering into an original, a cover, an improvisation between songs, during a transition during a rehearsal or purely as an aside. Clapton didn’t take the solo — that’s Robbie Robertson of the Band, the group whose sound the Beatles sought to emulate during the Get Back/Let It Be sessions. 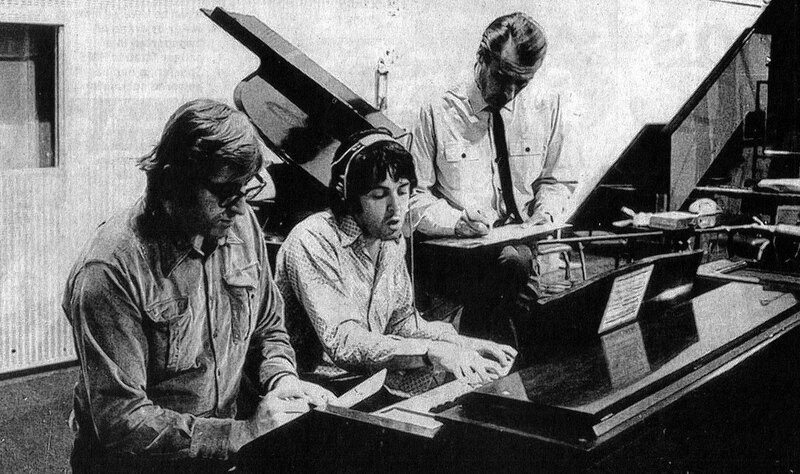 This same induction ceremony honored producer George Martin, who happened to miss the September 5, 1968, session whilst on vacation. Even Paul called the White Album “the tension album.” John said worse in the early ’70s. Ringo literally left the band for a few weeks in the summer of ’68. Four Beatles, each recording in a separate studio — we all know the stories. But while history is static, perceptions are variable. The 2018 reissue’s promotional campaign works to dispense with some of the darker sides of the session, from Giles Martin’s interviews to the numerous dismissals of dysfunction in the lovely hardbound book packaged with the deluxe edition. Indeed, there’s plenty of laughter and carefree spirit throughout the White Album outtakes. The outtake set even begins with laughter among John, Paul and Yoko, as if to hammer the point home. The Get Back/Let It Be sessions inherit the same sour reputation, yet it would be very easy to compile 50 tracks from January 1969 filled with laughter, chatter and the indication that nothing could ever tear these guys apart. And I bet if and when we do see a formal reissue campaign of Let It Be (which I suspect will be attached to a larger Abbey Road/”Beatles in ‘69” re-release), we’ll see that very recalibration of Beatles history. More “Suzy Parker,” and not quite so many calls for a divorce. And that’s OK. I’ve long posited that things weren’t necessarily so bad — or at least that much worse — for the Get Back/Let It Be sessions than in the period immediately before and after. Naturally, the reality lies somewhere in between. Neither the White Album nor Let It Be are outliers — that’s just how the group was post-1967. On January 7, 1969, the day before the rest of the Beatles learned the chords to “Let It Be,” George Harrison made it clear: “Ever since Mr. Epstein passed away, it hasn’t been the same… [the Beatles had] “been in doldrums for at least a year.” That takes the group to before their trip to India in February 1968. Together at the beginning of that trip, the individual Beatles returned to England separately. For the final stage of their career, they produced enduring music, though they may be parted.